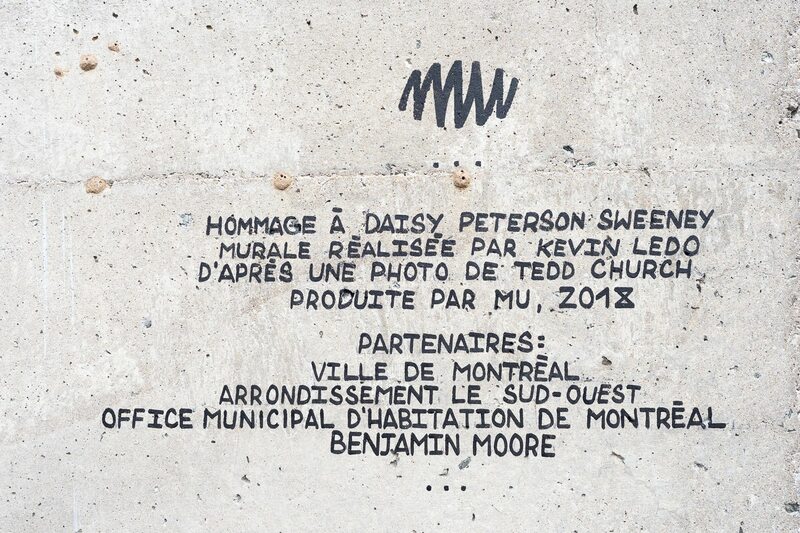 Le 23 octobre 2018, MU a inauguré, dans le quartier de La Petite-Bourgogne à Montréal, une nouvelle murale hommage à la musicienne Daisy Peterson Sweeney. “Cette murale, réalisée par Kevin Ledo sur le mur d’une habitation de l’OMHM, s’inscrit dans notre collection Hommage aux bâtisseurs culturels montréalais et vient enrichir la série consacrée au jazz qui comporte trois autres murales : deux consacrées à Oscar Peterson et Oliver Jones, elles aussi sur des murs de l’OMHM, et une retraçant l’histoire de la Petite-Bourgogne sur le mur d’enceinte d’Hydro-Québec. Musicienne et enseignante extraordinaire, Daisy Sweeney a eu pour élèves de nombreuses personnalités du jazz, notamment son frère Oscar Peterson, Oliver Jones, Ken Skinner, Joe Sealy et Norman Marshall Villeneuve. Elle a toujours cherché à rendre la musique accessible au plus grand nombre, en particulier auprès des jeunes, et s’est impliquée toute sa vie dans son quartier, La Petite-Bourgogne, où elle a cofondé le Montreal Black Community Youth Choir (Montreal Jubilation Gospel Choir). “La mission de MU est d’embellir Montréal en réalisant des murales ancrées dans les communautés locales. Le cœur de sa démarche : Créer des murales pour voir et vivre l’art au quotidien, pour déclencher une transformation sociale et pour léguer, à Montréal, un véritable MUsée d’art à ciel ouvert! Oû voir cette murale? 1791, rue Saint-Jacques angle St-Martin (métro Georges-Vanier), Montréal. 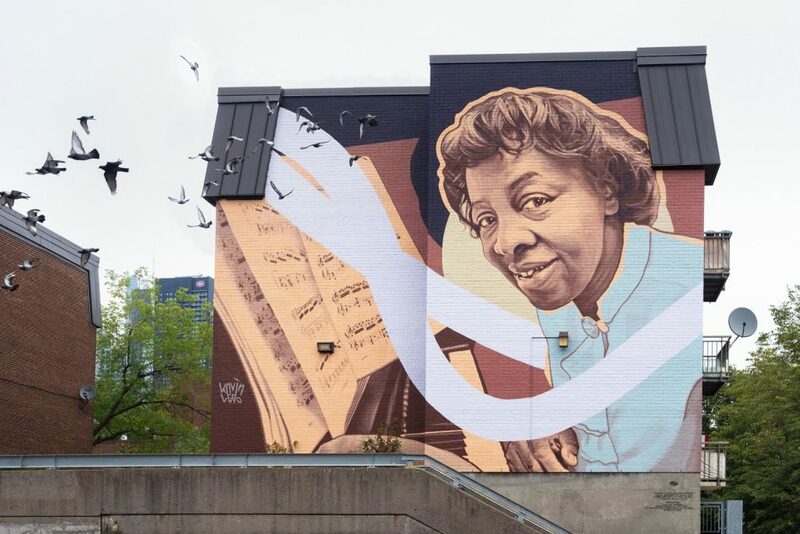 “Montreal, October 23, 2018 — MU, the charitable non-profit mural arts organization, inaugurated a new mural in the Sud-Ouest borough paying tribute the late great jazzwoman, Daisy Peterson Sweeney. The event took place in presence of Mme Sophie Thiébaut, borough councillor for the Saint-Henri-Est–Petite-Bourgogne–Pointe-Saint-Charles–Griffintown district, Oliver Jones and a number of family and community members. This new piece is the latest addition to MU’s collection Montreal’s Great Artists, an ambitious undertaking that has been a source of pride for the organization since 2010, highlighting the creative minds and forces of those who have made outstanding contributions to Montreal’s cultural scene. The mural was designed by Montreal artist Kevin Ledo, based on a photo taken by Tedd Church. A world-renowned portraitist, Ledo has previously collaborated with MU on a mural tribute to Janine Sutto, completed just before her death in 2016. Located at 1791 rue St-Jacques, at the corner of Saint-Martin, this is the fourth mural in a series celebrating jazz and exploring Little Burgundy’s musical heritage. 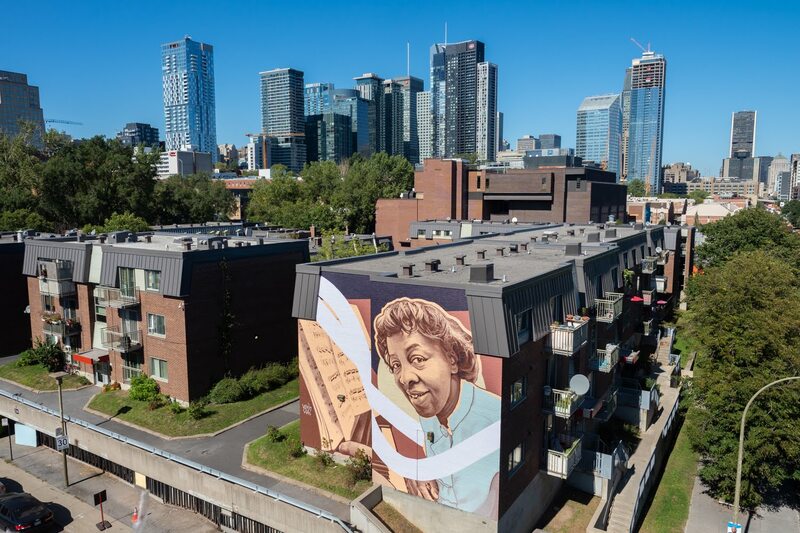 Another large-scale MU mural in the neighbourhood, created in collaboration with Hydro-Québec, retells the history of Little Burgundy, birthplace of Montreal’s jazz scene. Two additional murals honouring legendary jazzmen Oscar Peterson and Oliver Jones are located mere steps away. “MU wanted to establish a theme in the heart of Little Burgundy, one that celebrates the founders of Montreal jazz, and we are extremely proud to be adding a woman to this series of exceptional artists. I am particularly fond of this collection because it invites a new generation of Montrealers to discover our local art and history” said Elizabeth-Ann Doyle, MU’s Executive and Artistic Director. “We would like to thank MU for this new project. Little Burgundy now has four extraordinary murals that showcase our rich history. We must remember the vital contributions made by this talented musician, who motivated and accompanied some very gifted students, notably the great Oscar Peterson and Oliver Jones. We are still working towards finding a significant place to name after this amazing woman, one that will honour her memory,” said Benoit Dorais, Sud-Ouest borough mayor and chairman of the Montreal Executive Committee. “This is the 20th large-scale mural to go up on low-rent housing units in Montreal. These murals are a source of pride for tenants, employees and residents in the neighbourhoods where they exist. 2019 will mark the Office municipal d’habitation de Montréal’s (OMHM) 50th anniversary and we are looking forward to continuing our collaboration with MU,” said Danielle Cécile, Executive Director of the OMHM.